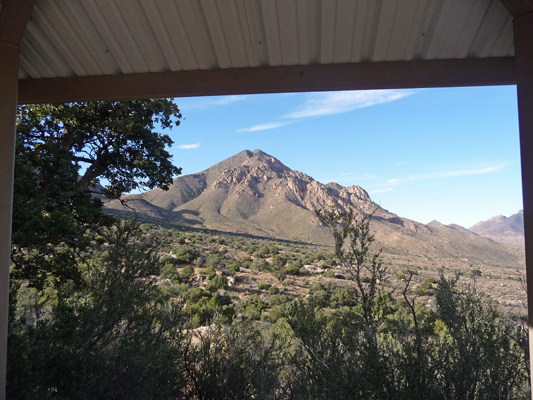 Thanksgiving was a lovely quiet day for us in Benson, AZ. 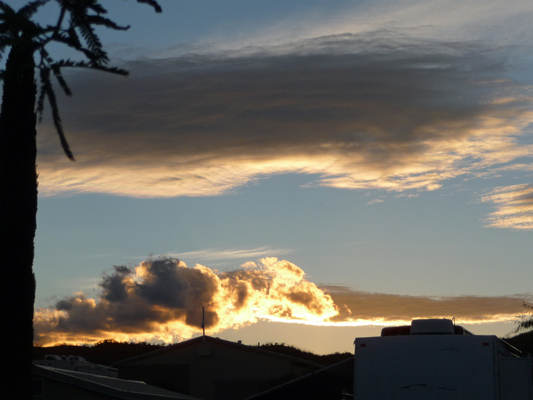 We set out for a walk in the late afternoon and Mother Nature gave us a show to add to our gratitude list. We turned to go down the hill and I caught this nice shot of the Dragoon Mountains lit up. 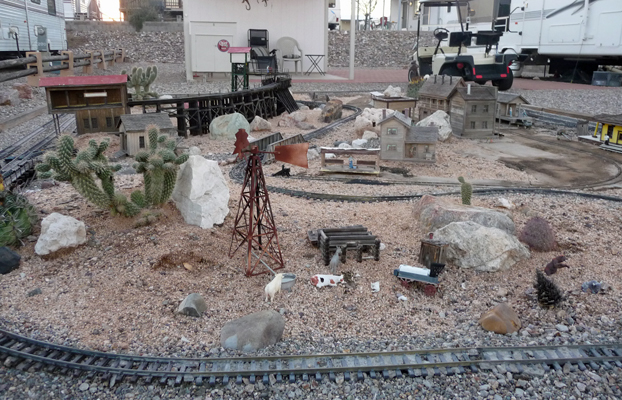 And as we turned down a street in SKP Saguaro Resort that we hadn’t walk down before we spied this wonderful model railroad set up in one of the leaseholder’s front yards. The trains weren’t out and running but it still was great fun. We were joined on our walk by a couple of old Green Bay Packers fans who were trying to get their walk in before the game that started at 6:30. Sadly for them, Green Bay lost to the Minnesota Vikings. But hey, we enjoyed talking and walking with these folks and when we got to the turn to go back up the hill I caught one more shot of the sunset before it was gone. We stayed one more day at Benson to stock up on groceries and to get Walter a new pair of headphones for the TV since one ear of his had died. We were pleased to discover that the Wal-Mart in Benson wasn’t full of crazy shoppers on Black Friday afternoon. Benson basically has a Safeway and a Wal-Mart and a few gas stations so it’s not exactly the center of the universe. 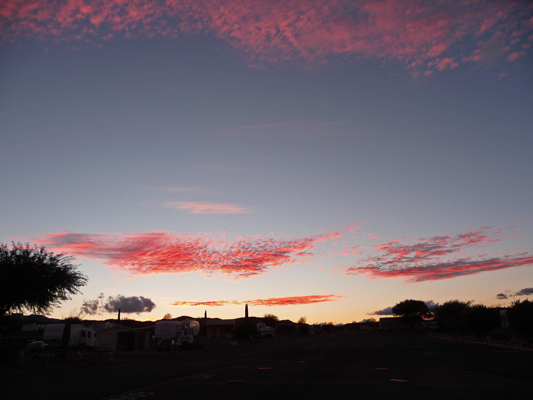 But it is under 30 miles to Tucson so we figure the folks who wanted to SHOP had gone elsewhere. Which was just fine with us. I had to take a shot of Walter with his new headphones just because they’re so stylish—white! He’s especially happy in this photo because the UW Huskies had just beaten WSU in the Apple Cup. He may be a Cal Bear alum but 30 years of living in the Seattle area made him a Husky fan. It was cold Friday night (down to 28 degrees). 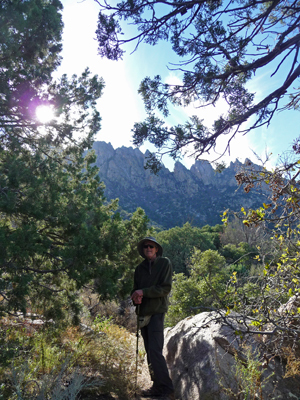 But it was sunny on Saturday morning November 28th, when we packed up to head east into New Mexico. 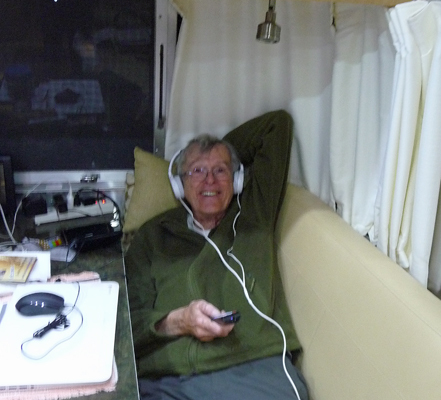 We had sun until after we hit the border but then we gradually drove into an area of dense low lying clouds. 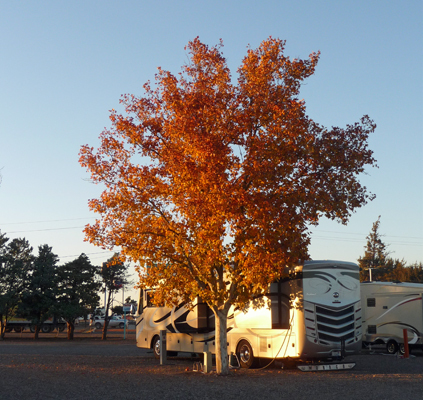 We got a little mist, but no rain and arrived safely (even if our GPS sent us to the wrong location) at the Dream Catcher RV Park in Deming, NM. Deming isn’t anything special really but it was 200 miles from Benson so it was the perfect place for us to stop. 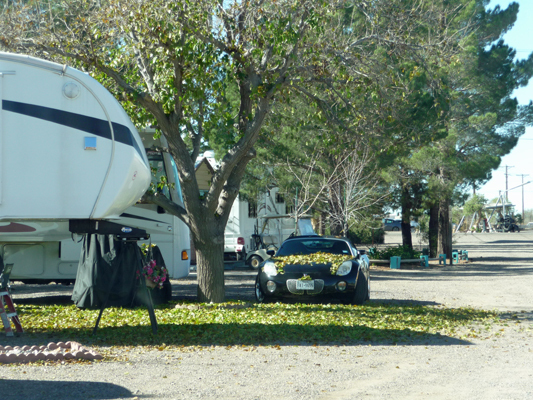 Besides, as Escapee members we could stay at the Dream Catcher RV Park for just $20 a night for a full hook up since it’s a Rainbow park owned by the Escapee organization. It was only 46 when we arrived but there wasn’t much wind which was a blessing. This is new territory for us. 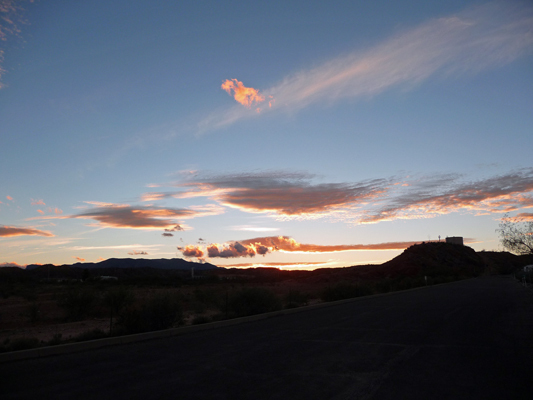 We’ve been across New Mexico several times but have always gone further north through Albuquerque and Sante Fe. This route takes us along the southern border. Deming is only 35 miles from the Mexican border. We had a bit of drizzle that night, but the weather people on the TV promised that it would clear off come Sunday morning. We awoke on Sunday November 29th to very low clouds and a temperature of 47. We packed a picnic lunch and headed north in hopes that the sun might come out eventually. And glory be, as we drove northwest up Hwy 180 towards City of Rocks State Park, we drove right out of the clouds and into the sun! Hooray. The land in this area is mostly rolling grasslands with a few cattle grazing here and there. But at the edge of the horizon you can see an exposed ridge of columnar rock that is part of a volcanic formation called the Kneeling Nun Tuff. 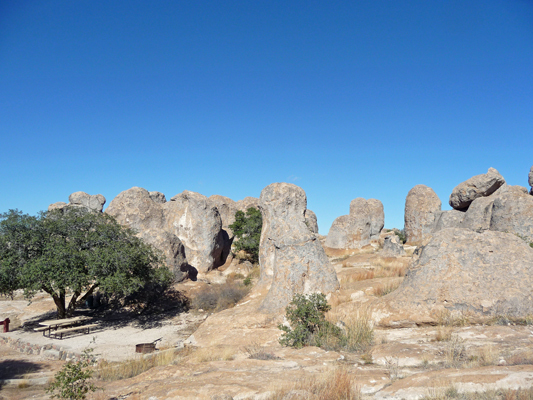 The City of Rocks, which is part of this formation, rises out of the grassland like a small town of pumice buildings. We drove the road that goes around the main cluster of formations (it’s only about 3/4 of a mile long) checking the place out. And then found a parking spot in the Day Use area next to a small botanical garden (signs and lots of cacti). There’s a trail that winds through the heart of the rocks that starts just across from the Day Use parking. It’s all nicely lined with stones so it looks like this will be a simple trail follow. Except of course, once you’re in amongst the rocks, the trail markers disappear and you just get to wander to your heart’s desire. 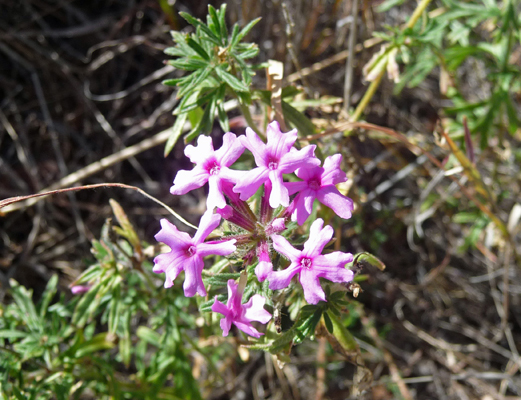 There was what looked like a form of desert sand verbena (Abronia villosa) in bloom here and there (there had been rain here over the last month). 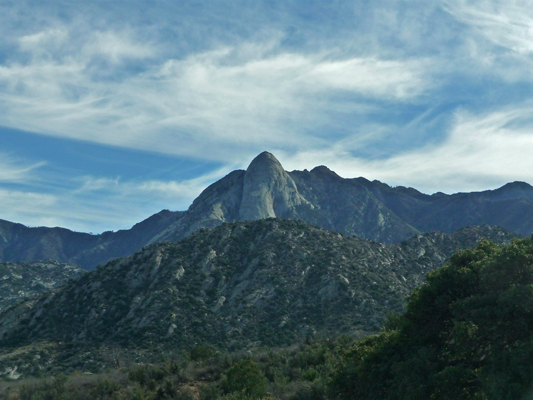 Now and then we’d come to a small road that led into a campsite and a view the mountains to the east. I thought it was pretty amazing that there was no one climbing on these rocks. They have a nice rough surface so they’re real easy to walk on. Admittedly they’re not real high so you wouldn’t expect serious climbers to bother but you’d think there’d be kids out on them. Of course, it was Sunday afternoon of Thanksgiving weekend and the campground was emptying out so maybe there had been kids on them earlier in the weekend. 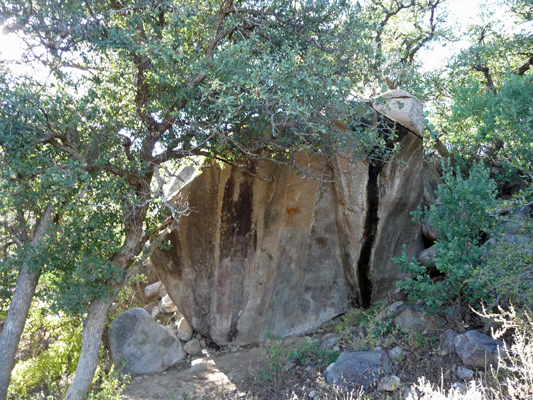 We hiked through an area that had large round grinding holes left by the Mimbres Indians who lived in the area from the beginning of the Christian era until about 1250 A.D. They all had water in them and looked more like deep puddles than grinding holes so I didn’t take any pictures. Just past them we came to yet another dry camping area with a lovely view. We climbed down here and made our way out towards the perimeter road. 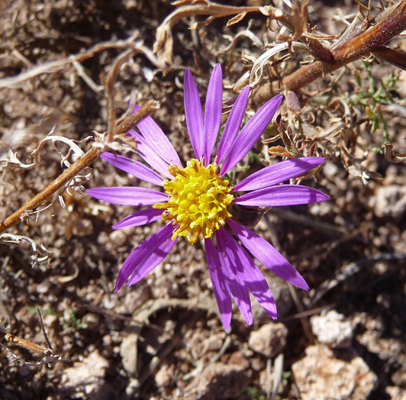 And I spied the tiniest little aster-like flowers. This baby probably wasn’t more than an inch and a half across. 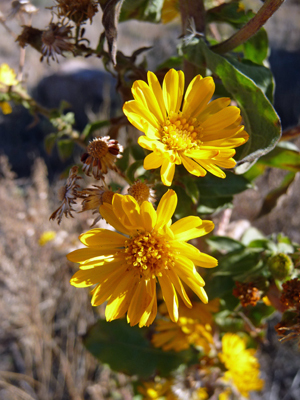 We walked back along the road and came upon a 4 foot tall plant with little yellow daisy-like flowers on it’s stem. It’s no doubt a weed, but it’s a pretty weed. 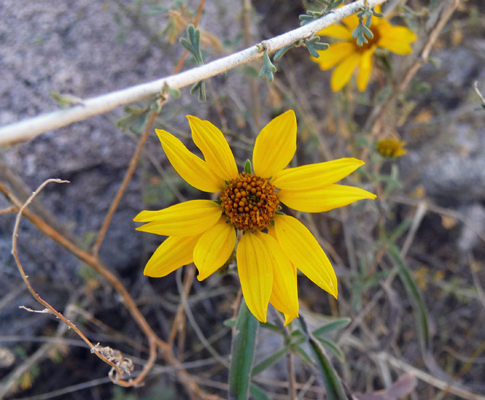 With some research I've come to think that this is probably Camphorweed (Heterotheca subaxillaris). 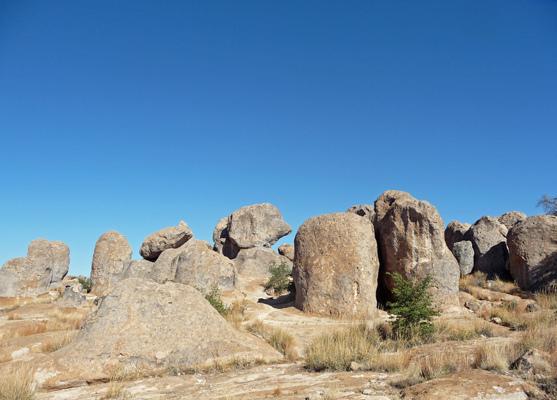 Here’s a nice panorama shot I took of the rocks on our way back. If you look carefully in the middle of the picture you’ll see a picnic table. The path on the left leads up to a campsite in the middle of those rocks. Meanwhile it had warmed up nicely and was close to 60 degrees. We were sheltered from the wind by the rocks so it was a really pleasant little hike. 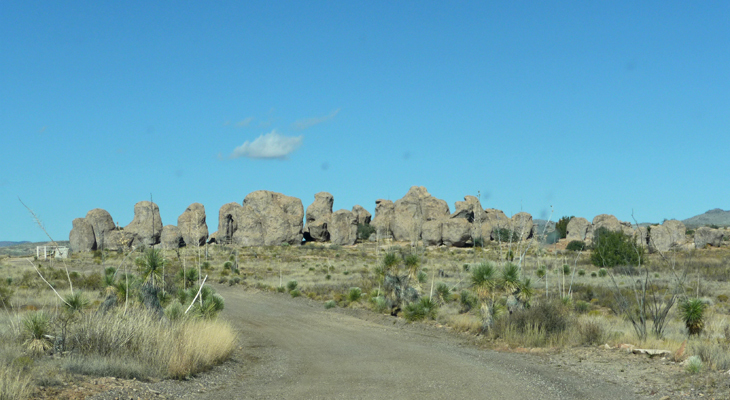 From City of Rocks, we continued north on Hwy 180 to the town of Silver City. 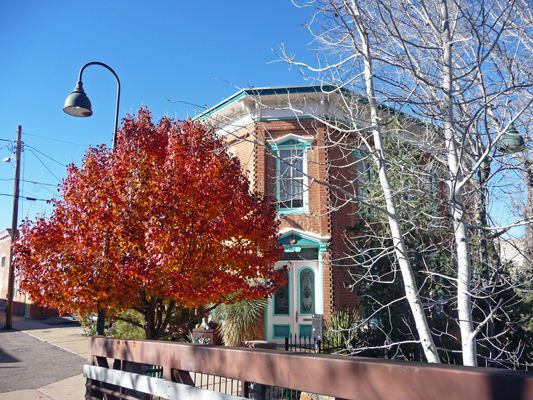 From the write up and photos this sounded like another little town like Bisbee or Butte. The country’s largest open pit copper mine is here (and still operating and providing jobs) but the town was founded back in the 1870’s during a silver boom. It turns out this is a pretty good sized city. Western New Mexico State University is here and the town sprawls out in all directions providing lots of ‘modern’ shopping and fast food. We headed for the Visitor’s Center which turned out to be just across the way from the historic downtown area. The town was originally all built of brick in hopes of preventing the fires that were the plague of so many early western towns. Instead, a series of floods raged right down Main Street and washed away all but one of the original buildings. The floods (1895 to 1903) created a strange feature (55 feet deep) called The Big Ditch (named after the Panama Canal). It had a little water in it, and it wasn’t hard at all to imagine torrents of water raging down it. When you go across the bridge from the Visitor’s Center you come to the Warren House, the only building that survived the floods. 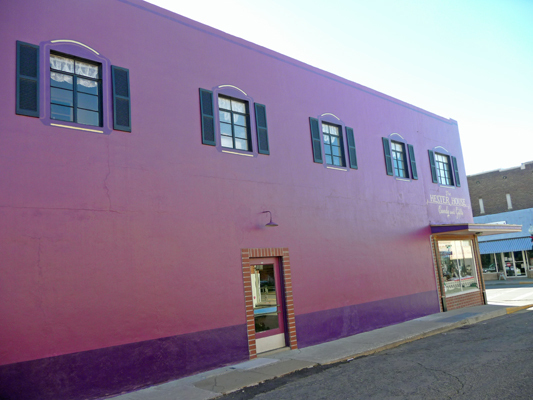 Just across the street a little ways was a huge long PURPLE building—only in New Mexico—with lace curtains in the upper windows and a candy store on the end. Don’t you just love it? Historic Downtown is a mix of turn of the century buildings and just plain old boring 1930’s storefronts. There is a thriving artist’s colony here and a healthy performing arts culture too so there were lots of galleries mixed in with empty stores and karate studios—and of course antique stores selling dusty bottles. We shared a plate of wonderful lamb tapas at the Tapas Tree Grill in a little area with lots of studios. 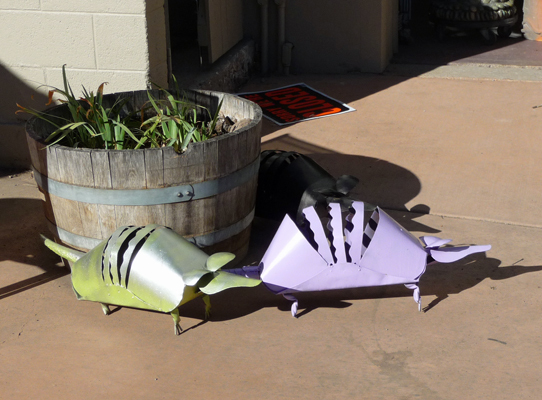 I want one of these armadillos—especially in lavender, don’t you think? 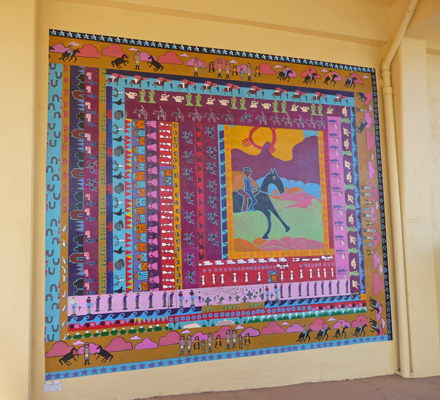 There was also this great mural (Fort Bayard History) the wall at the entry of the little plaza in front of the restaurant. The folks in New Mexico are not afraid of COLOR. Silver City wasn’t exactly what we’d expected (no place ever is, I guess) but we enjoyed ourselves. 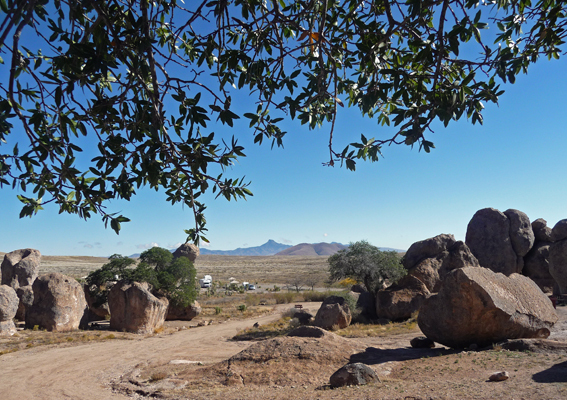 It’s only 40 miles from Deming so if you’re in the area, it’s certainly worth the trip. It’s at 6,000 feet so they have winter here. But the lady at the Visitor Center said that the snow is usually gone by the end of the day. Further north a couple of hours (we’ve read the drive is pretty but very winding) you can visit the Gila Cliff Dwellings. We’ll have to leave those for another trip since it’s just too high and cold at this point. We got home in time for Walter to watch the Seahawks beat the Steelers in a game that went back and forth more times than I care to count. It looked cold in Seattle, so I won’t whine about it getting down into the 20’s at night here when it warms up so nicely in the daytime. Just before sunset the tree outside our back windows lit up nicely. It’s nice to have a little autumn color still. 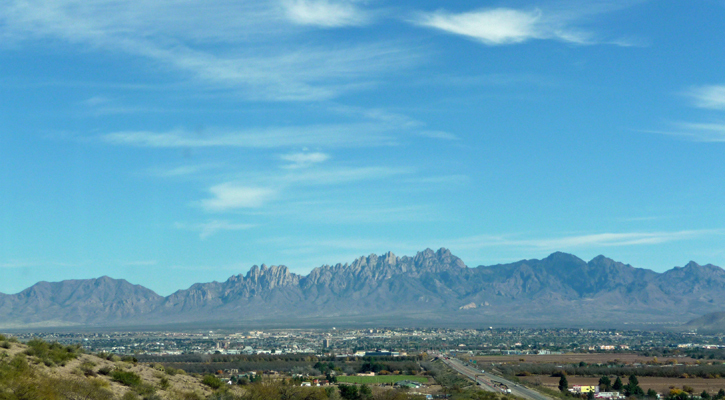 On Monday November 30th, we drove east towards Las Cruses and the Organ Mountains. 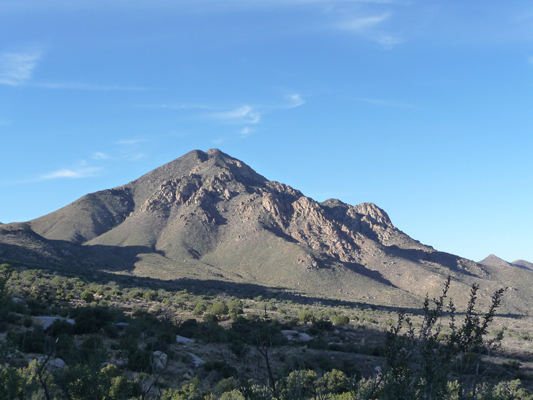 The Organ Mountains are part of the new Organ Mountain Desert Peaks National Monument that includes the stretch of mountains directly ahead in this photo plus Picacho Peak to the north and the Kilbourne Hole Volcanic Crater National Natural Landmark to the south. It’s as if someone collected up all the interesting BLM properties in the area and made them into a National Monument—all just a year ago (2014). 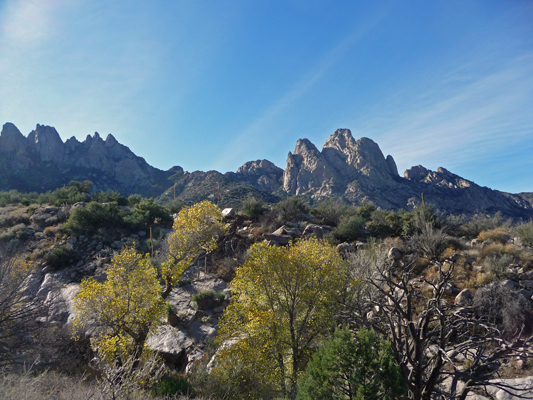 We hemmed and hawed about which side of the Organ Mountains to visit. 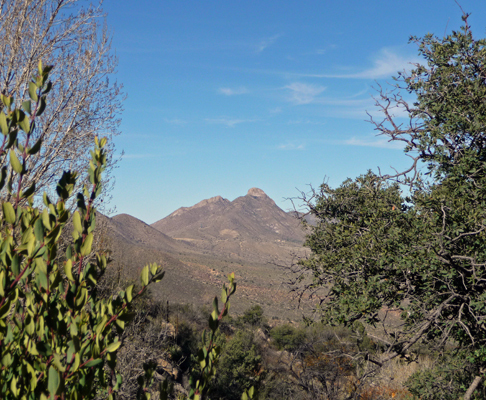 You can go to Dripping Springs Natural Area which is on the west side near Las Cruses or you can go over the pass and go to Aguirre Spring on the east side. There are two National Recreation Trails at Aguirre Spring plus some good photo ops so we decided we’d go the extra distance and go there. It did not disappoint. 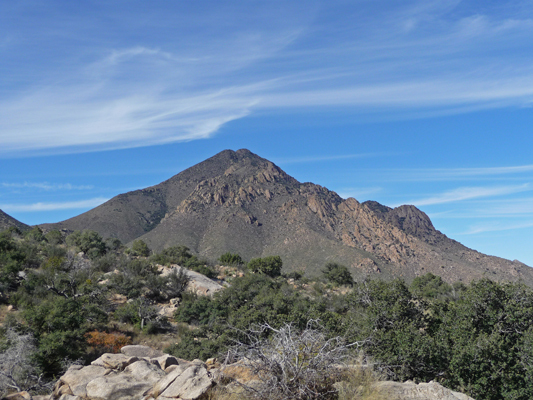 On the drive into Aguirre Springs off Hwy 70 you get your only view of this interesting formation called Sugarloaf, as it grows out of the lower hillsides. 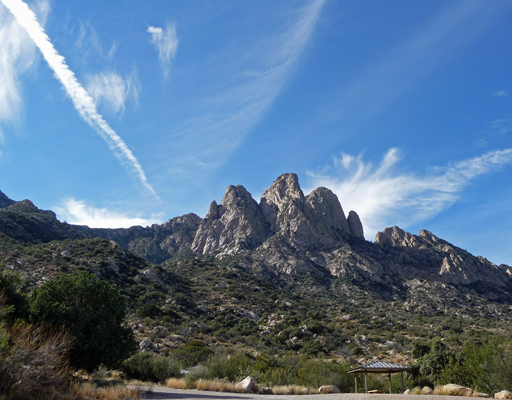 Aguirre Springs has a campground (with water at the entrance but none at the campground itself) that you have to drive a long winding one-way road out to reach. They limit the size of the RV’s to 23 feet in the campground because there is a real tight hairpin turn on the way in and a very steep dip on the way out. But the views from the campground are wonderful. And every campsite comes with a covered picnic table—clearly it’s HOT here in the summer. 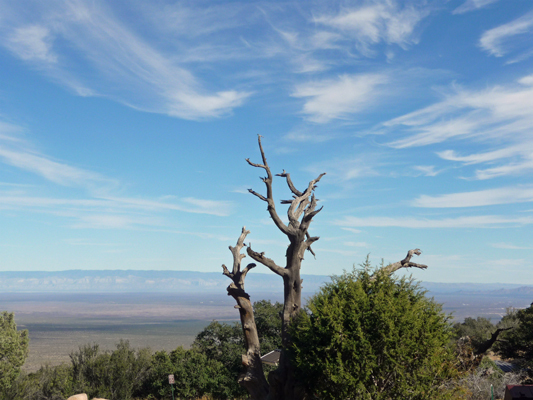 Looking eastward you can see the Mesilla Valley out towards White Sands Missile Base which is behind the dead snag. And the view to the northwest is pretty swell too. 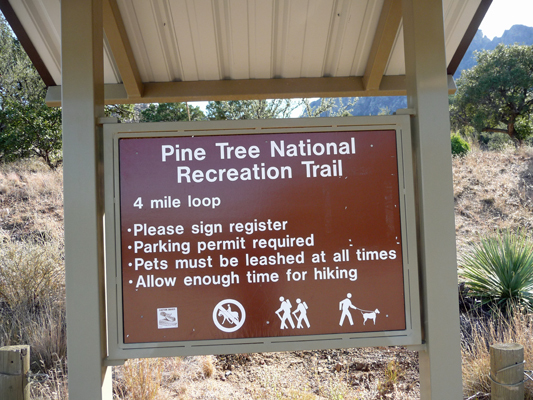 We decided to take the Pine Tree Trail which is a 4 plus mile loop with a gain of about 1,000 feet. We didn’t plan to do the whole thing, which is good because we would have run out of time before the sun sank behind the mountains and the temperature dropped. The road into the campground is one-way and you have to keep following it out of the main loop to find parking at the trailhead. We signed in on the register (only one other set of hikers on the trail that day—and we only saw one set of folks in the campground too) and headed on up the hillside. In a short distance you come to this not very reassuring sign. Like I said, it’s HOT here in the summer and these hikes take WAY longer than you think they will even in November. 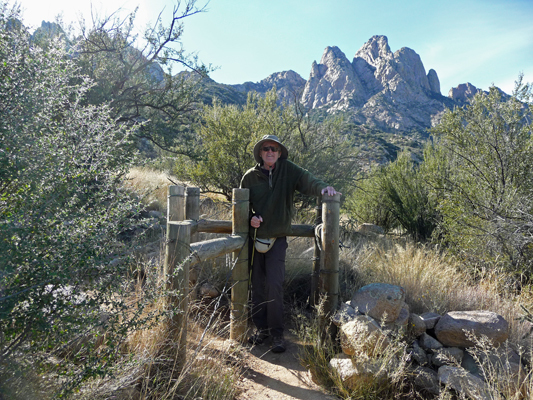 This is land that is administered by the BLM and there is a large cattle ranch right next to the area so there are fences all around to keep the cattle out and this fun stile to help the hikers get out. 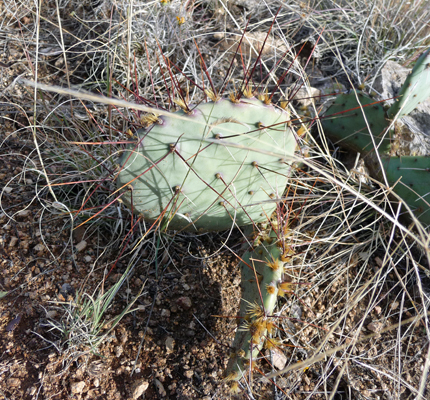 The hillside is scattered with Desert Candle (Dasylirion leiophyllum). There’s a forest of them on the drive in. 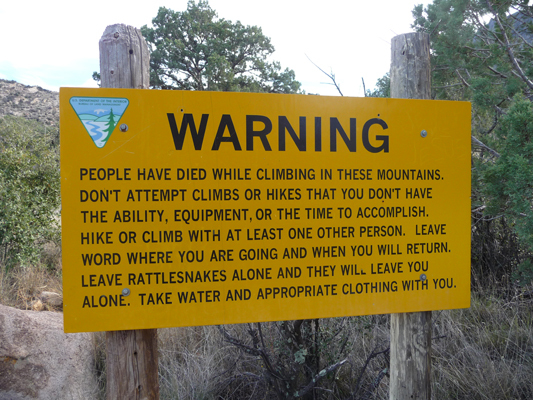 After climbing a ton of rocky ‘stairs’ you come to where the trail divides to form a loop. We went left since our trail map indicated it might not be as steep. 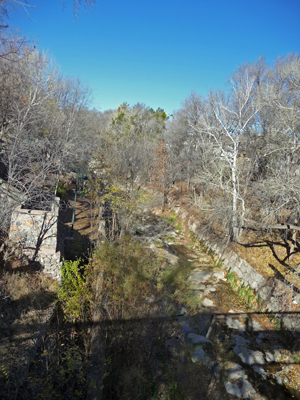 There are seeps all over the hillside here—hence the name Aguirre Springs. Here and there I spied few spindly sunflowers. I really hadn’t expected to see any flowers this time of year but hey, I’ll take what I can get. As the trail climbs you get more of a view of the mountains to the north. We crossed a dry creek and then wound up the hill some more which gave me a nice view of some willows and the mountains. 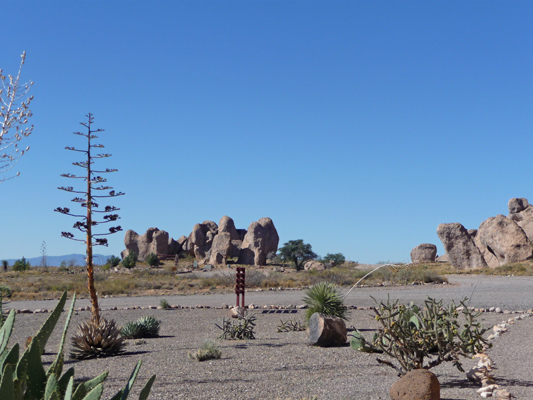 I think that the formations straight ahead are called the North and South Rabbit Ears. 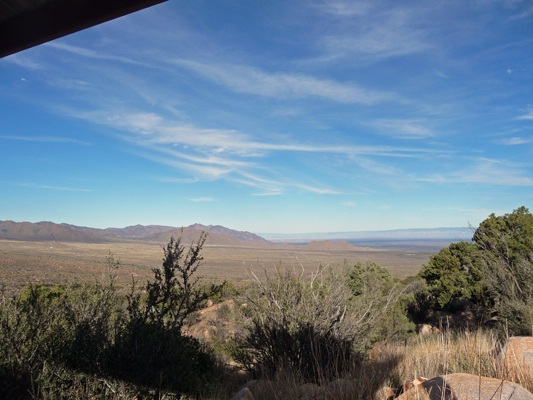 We kept climbing on up the very rocky trail until we had a nice view across the Mesilla Valley. In the far distance the little streaks of white are the white sand dunes of White Sands National Monument. The sun’s steep angle made photos to the southwest really challenging but this juniper helped me catch Walter and a few of the spires to the south. We’d hiked for about 45 minutes and were ready to turn around so we rested a while on these big rocks and then made our way back DOWN hill. Some of the rocks were pretty challenging on the way back down. 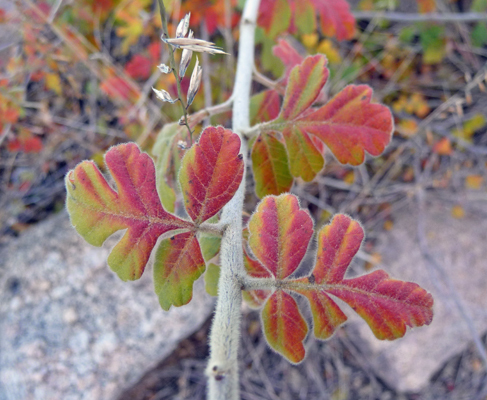 There were shrubs with nice full color and fuzzy stems but I haven’t a clue what they were. 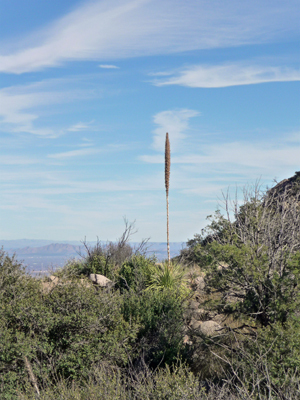 Near the bottom we came to a small stand of really long spined beavertail cacti. These always give me the willies. We got down just in time to have our lunch at one of the picnic tables before the sun sank behind the spires. Here’s the view from our picnic ramada. To the right, we could watch the mare’s tail clouds speed across the sky. They looked like someone had air brushed them onto the sky. It was down to 48 by the time we finished our lunch but the sinking sun allowed me to catch this fun shot of the Organ Mountains to the southwest. And of the long shadows to the northwest. 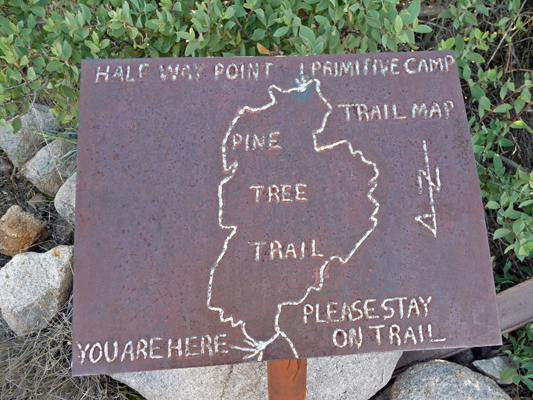 The trail was a nice workout for us and I’m sure folks who are used to really rocky steep trails would enjoy doing the whole loop which is supposed to take you up to a scattering of Ponderosa Pines up near the base of the spires. Just give yourself LOTS of time. It was 24 degrees Monday night and the water hose to the trailer froze solid so we had to use our water storage tank and water pump on Tuesday morning. No damage done thank goodness and it was a real interesting project to get the hose wound back up when it was time to go—crunch crunch crunch! The other interesting thing that happened was that all these green leaves fell off of several of the trees in the park in the morning. Some of the trees whose leaves had changed color dropped theirs too but I’ve never seen green leaves drop this fast. Talk about fast forwarding through autumn.